If I am going to finish the Twin Cities marathon in October, I need to be prepared for anything mother nature throws my way. My hubby ran the marathon in 1997 and I believe it was one of the hottest in Twin Cities Marathon History. The rate things are going this summer, who knows what to expect come October 2nd. Right now the Midwest is facing one of the worst heat waves in years according to the Daily Beast. Here in the Twin Cities we’re under an excessive heat warning through Wednesday night. That means high temperatures plus humidity will equal heat indexes topping 100 degrees. 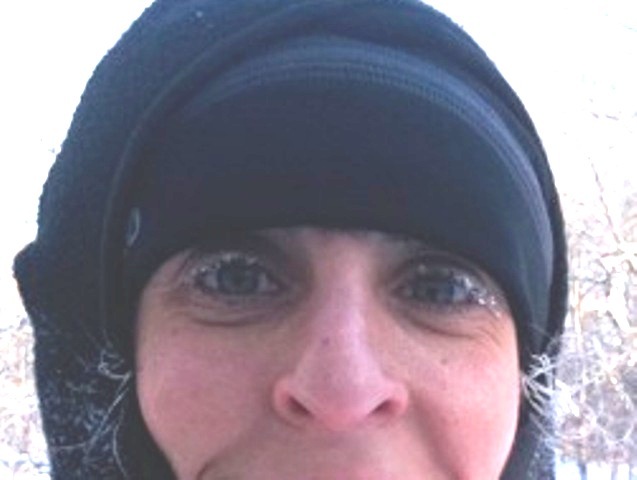 It’s hard to believe this past winter I wrote about conquering my fear of running in extreme cold called:“Really Digging the Snow and Cold”. I believe we tackled eight miles or so in sub-zero temps. I’m beginning to think Minnesota should get a new slogan. Instead of Land of 10-thousand Lakes, how about Land of Weather Extremes. And what’s crazy is that so many Minnesotans don’t seem fazed by it. I couldn’t believe all of the people out biking and running by Lake Calhoun yesterday afternoon as I drove home from yoga class. And I guess I am now officially one of “them”. I like to call them weather warriors. We don’t hibernate inside when the weather gets classified as dangerously hot or cold. We gear up and prepare for it. That was never me before. No, No, No. When the temps got tough, I stayed inside. A few weeks ago, on another day forecast to be 100 degrees, I woke up, looked at my husband and said maybe I should just run tomorrow (Saturday) instead. He looked at me and said “You need to run today. You need to learn how to run in this heat and humidity so if you are faced with heat on race day, your mind and body will be ready!”. So I got out of bed and went to meet my running club friends at our regular 9:30am time. I couldn’t believe what I was hearing. Coach asked “How far do you want to run today?” Answers from the group were, “10 miles, 12 miles, 14 miles.” My eyes just about popped out of my head. It was hotter outside than in my hot yoga class, so I started asking folks how it’s physically possible to run that far when you feel like you are in a sauna. One gal pulled out a ziploc of electrolyte capsules. She explained that she typically pops one or two pills every hour. Another gal had electrolyte tablets. They look and work kind of like Alka-Seltzer. You mix them with water and voila: Pop pop fizz-fizz, oh what a relief it is. I also brought along a couple of bags of sports beans which have electrolytes. They taste like jelly beans and I eat a few every 3-4 miles. So off we went. By mile 2 we were all a sweaty mess. But we kept going with lots of water breaks (every couple of miles or so). And we didn’t just drink the water and fill up our bottles, we also splashed the cool water over our faces and shoulders. About 6 miles in, I was offered and accepted an electrolyte pill and made it to mile eight before I started to feel a tingling sensation. Maybe it was just the sweat beads cooling me off with the breeze. I decided to continue on with the group. If I had been wearing my heart rate monitor, my guess is my heart rate would have been hovering at the top of zone three. At the speed we were going (9:30-9:45 minute miles), it would normally be in zone one or two. Despite the elevated heart rate, the rest of me felt fine. My legs, arms and back all felt pretty strong. I credit the electrolytes and the advice to hydrate the night before. I am not saying everyone should run in the heat, but it is possible if you are smart about it. I would have never done it by myself without a coach, friend or guidance. This wasn’t me just waking up one day and saying “I want to try running in extreme heat!” I have been running for a couple of years now and training for several weeks, but this was by far the hottest day I had ever run in my life. And I did it! I finished the 12 miles with a few short walking intervals towards the end. What was even more telling to me is that I felt fine the rest of the day which means I did not overdo it. Again, I believe the key was the hydration and the electrolyte supplements. Today we are faced with another steam bath for our run and I could easily talk myself into skipping it. So I refer back to this video for inspiration. You can see the ultimate cool-off strategy at mile 10. Would love to hear about the worst conditions you’ve ever faced in a training run or race and how did you get through it? What are your survival tricks? And if you are looking for more expert advice on how to run in the heat, click on this link to active.com for their featured articles on the topic. ← Mom versus the Mosquitos! Dont Say if you are going to finsih the marathon.. You will finish no matter what the weather is that day.. I am cheering for you!!! The weather is just part of achiving a goal…and you are doing a fantastic Job with your trainning and dedication! You rock Lori…you can do anything you put your mind to! Thanks Susan. Right back at ya! I miss our stepping days. Can’t believe how big your little ones are getting. I’m training for Twin Cities too. This weather has been tough! BUT, you are right, it will make us stronger and ready for anything the weather gods throw at us on October 2nd. The hottest marathon I’ve done was grandma’s in 2009 (race report on my blog marathon history). It was 80 and full sun by the time I was done and it SUCKED. Nothing to do in those conditions expect slow down the pace and keep on putting one foot in front of the other. You WILL finish on October 2nd! Thanks for the encouraging words Cindi. I look forward to checking in on your training through your blog. Loved the blog that talked about “You know you are a runner when….”. Cheers to cooler running tomorrow. Very uufesl nicely written and put my mind to rest as have my first marathon tomoz.